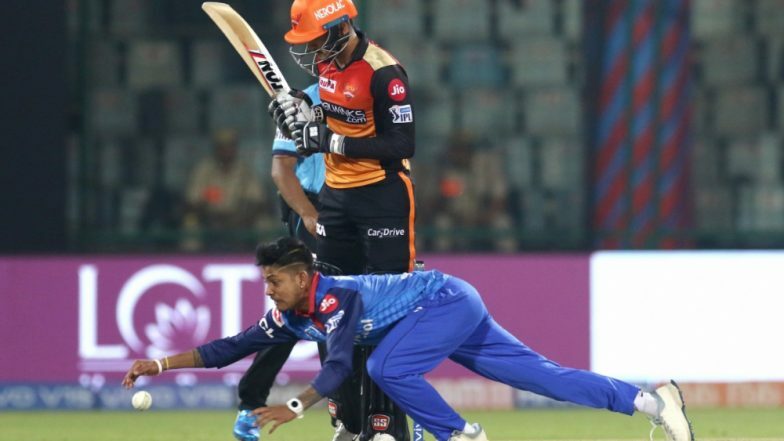 Sunrisers Hyderabad registered their third win of the Indian Premier League 2019 (IPL 2019) as they beat Delhi Capitals by five wickets. The win now takes SRH on top of the IPL 2019 points table. Meanwhile, this was second back to back defeat for Delhi Capitals who now have three wins from five matches in their kitty. Set a paltry target of 130 runs, Sunrisers completed the chase in the 19th over at the loss of five wickets. DC vs SRH Highlights IPL 2019: Sunrisers Hyderabad Beat Delhi Capitals by 5 Wickets. David Warner and Jonny Bairstow once again helped Sunrisers Hyderabad get off to a decent start. The duo added 64 runs for the first wicket. However, in quick succession, both Bairstow and Warner lost their wickets and it gave Delhi some hope. Delhi chances further rekindled when Sunrisers lost three wickets for just 16 runs in space of four overs. With half a side back in the hutch, Sunrisers required rate was close to six runs per over. The game looked set to go down the wire but Mohammad Nabi capped off his another brilliant outing with a valuable cameo of 17 runs off just nine balls. Nabi smashed Kagiso Rabada for a four and a six to seal the deal for his side. IPL 2019 Points Table Updated: SRH Topples KXIP on Top of Indian Premier League 12 Team Standings Following Win Over DC. # David Warner and Jonny Bairstow registered their fourth 50-plus opening partnership in IPL. # Mohammed Nabi has featured in seven games for Sunrisers so far and they have won all those matches. # The win was SRH's fourth in five matches against Delhi at the Feroz Shah Kotla. Earlier, batting first, Delhi Capitals kept losing wickets at regular intervals and were eventually restricted at 129 for eight. It was Axar Patel’s 13-ball 23 that helped Capitals go past the 120-run mark. Captain Shreyas Iyer was top-scorer for the home side with 43 off 41 balls. For Sunrisers, skipper Bhuvneshwar Kumar, Nabi, and Siddarth Kaul picked two wickets each. Rashid Khan and Sandeep Sharma chipped in with a wicket each.